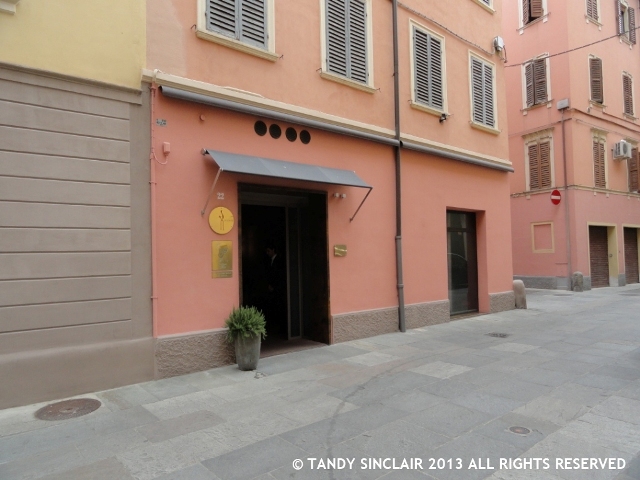 Rated currently as the world’s 3rd best restaurant, Osteria Francescana is situated on an unassuming street in the old city of Modena, Italy. The menu is divided into two themes, from the sea and from the land. To follow the progression of the menu you would start with appetizers, move on to salumi and then have a 1st course and a 2nd course followed by cheese and desserts. We however chose the Traditions Tasting Menu which explores Emilian ingredients and traditions over 6 courses (€110). 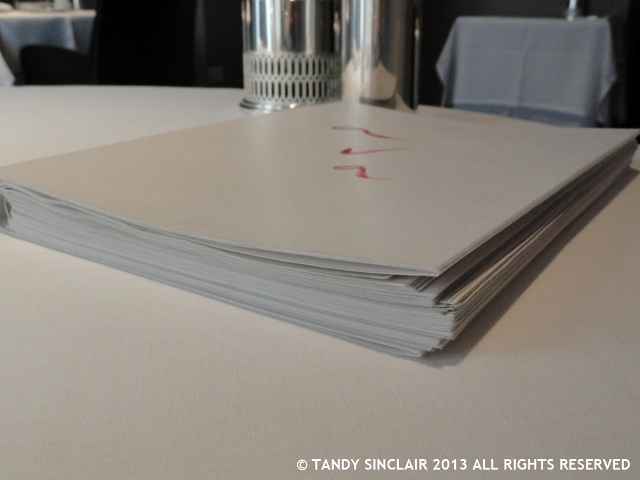 The wine list was presented to us and it is so large that it actually has an index. Wines range from €30 to €1150 and are divided into regions and countries. We could not have a glass of prosecco to start and a glass of red wine after that and the wine pairing was an additional €65 per person. We chose a bottle of Russiz Superiore Merlot 2007 (€60) and this is by far the most expensive bottle of wine I have ever ordered. The wine was fantastic and the wine service excellent with our wine glasses and water glasses constantly being topped up. The only thing I was surprised at was that we were not asked whether we wanted a second bottle of water or not – an open one just arrived at our table to replace the one we had finished. However, the 2 bottles of San Pellogrino water cost only €6 which is quite reasonable considering we saw small bottles of ordinary water for sale at €1.50 in the shops. 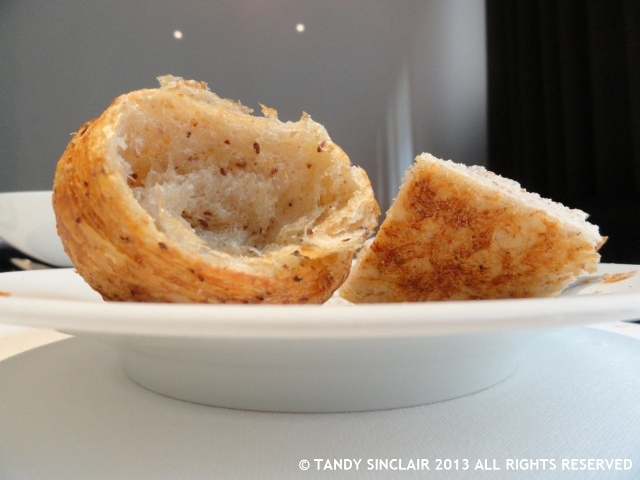 There is no end to the supply of fresh bread and it is baked on the premises and served with olive oil. We were offered a variety of rolls and bread sticks and I am quite sure that had we managed to finish what was on offer more would have been brought to the table for us. The meal starts with Memory of a Mortadella Sandwich. 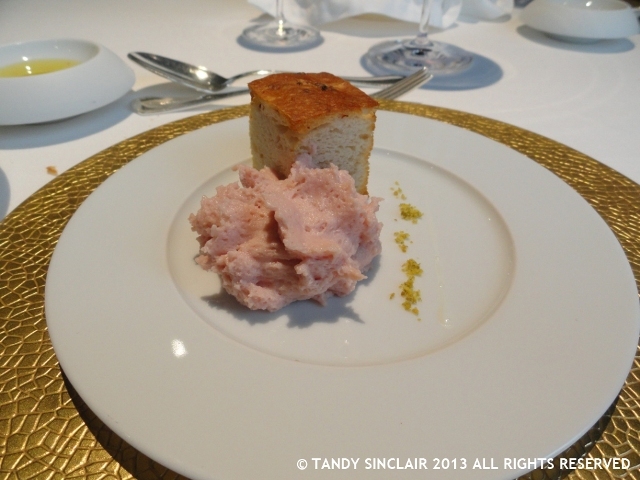 This is a pink mousse of mortadella and it is smooth and creamy and very tasty. This was followed by Proscuitto from Parma. 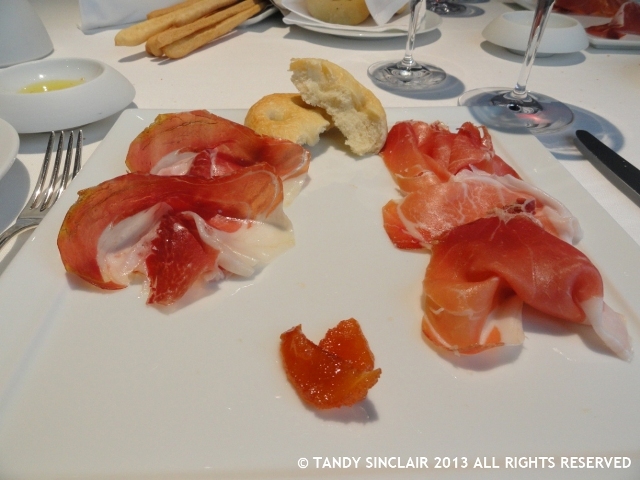 It is served with bread that is made with honey and the proscuitto are two differently aged varieties, one being aged for 36 months and the other for 42 months. Accompanying the meat is a spiced condiment and there is a distinct taste difference between the two. However, there was nothing special about this course as proscuitto in all forms and ages is readily available in any of the specialty shops and supermarkets in Italy. We then had Taglietelle with Bolognese Ragù. 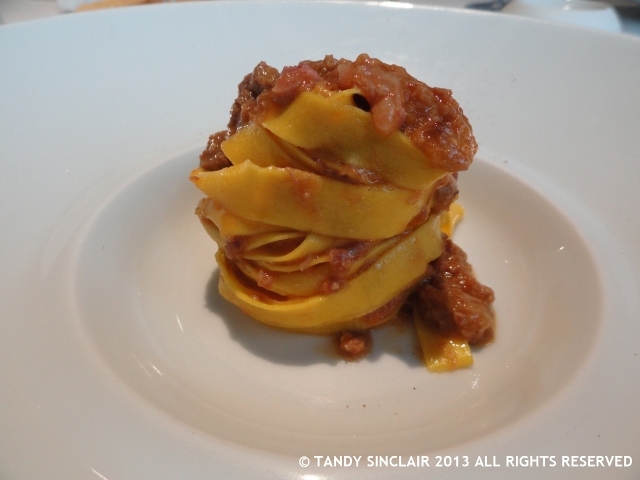 The pasta is handmade and the ragù is very tender. The ragù is shredded meat and tastes as if it has been cooked over an extremely long period of time. Our second pasta course was Traditional Modenese Tortellini in cream of Parmigiano Reggiono. The sauce is served tableside and we are told that the cream comes from the white cows of Modena. The Parmesan sauce is intense and you can smell the richness as you bring the fork to your mouth. The tortellini were very ordinary and we bought some home made tortellini in Bologna that were as good and as tasty. 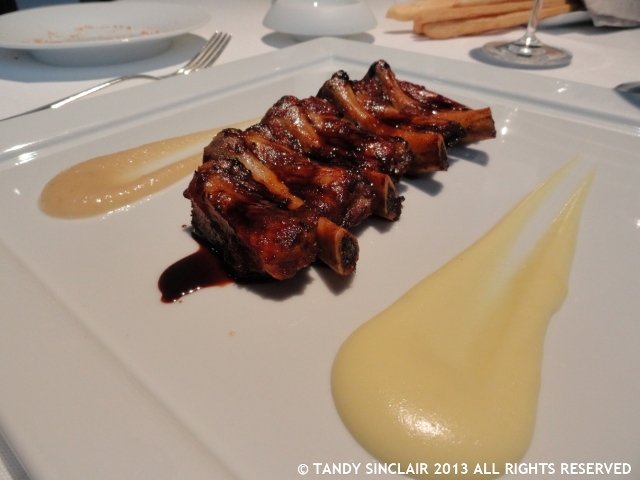 The meat course was Mora Romagnola Ribs lacquered with Traditional Balsamic Vinegar of Modena. This meat was sublime and plated so that the bones were separated from the meat. It was soft and succulent and very rich and another dish that had clearly been slow cooked. Dessert was a Warm and Cold Zuppa Inglese. I was not taken by the pink jelly which tasted of cloves to me. 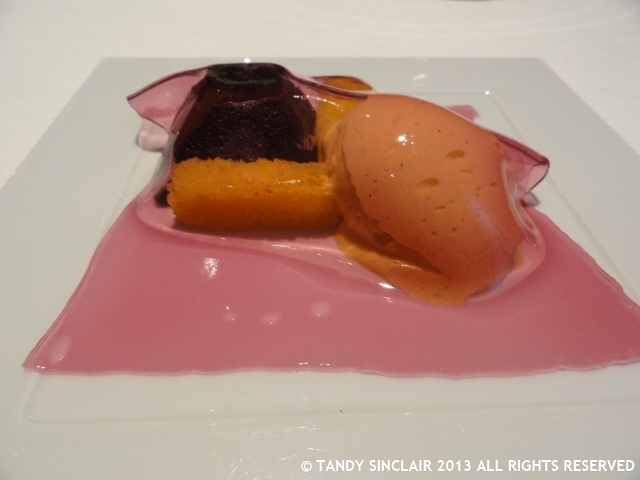 It covered a deep, dark intense chocolate fondant, a sponge that I think was soaked in alcohol and a vanilla ice cream that had a floral note. After our meal was complete we ordered an espresso and a machiatto (€6 for both). 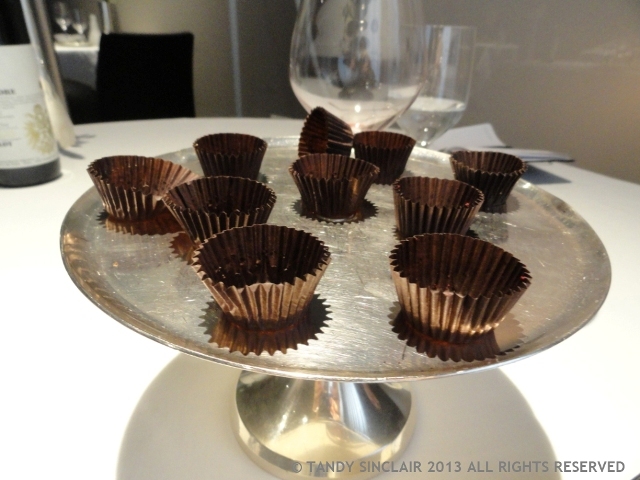 These were served with petit fours and the first one I bit into had a lovely raspberry flavour. The second one was a madeleine and the third a liquid hazelnut in a chocolate cup. 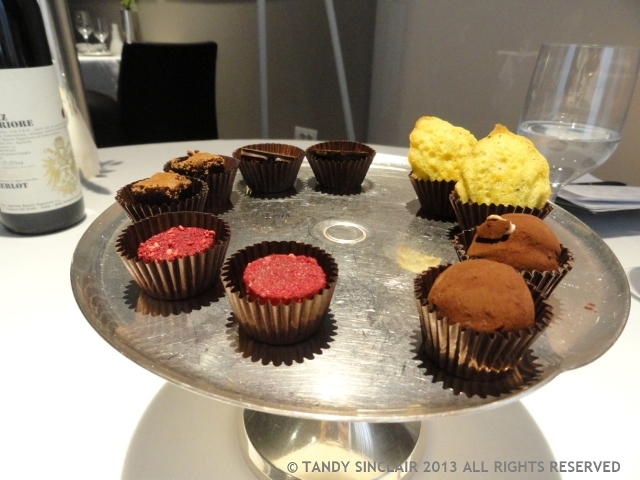 There was a brownie with a hint of mint and a chocolate truffle with a milky liquid centre. The service staff are all formally dressed in black and as we walked in one staff member took our jackets while Dave and I were led to the table by two other staff members. There is always a waiter in the room to attend to your table and to clear the plates away. Each course is presented by at least two serving staff. Cutlery is laid out for each course, before it is served, and the table is completely cleared before the dessert is set in front of you. If you leave the table, a fresh linen napkin is placed at your seating. There are two separate dining rooms in the building and the one we were sat in had 4 tables. There are 12 tables all together and I counted at least 6 serving staff as well as a maître d’. The staff all speak English as well as Italian and each course is explained to you as it arrives. There is a waiters serving table in the dining room and beautiful tall lamps provide the lighting. The décor is stunning down to the small touch of an orchid in the ladies bathroom. The rooms are so quiet with thick carpets and subdued wall colouring. Wine is served in Spiegelau glasses and I am convinced that the glassware does indeed make a difference to how wine tastes. I must say that I had very high expectations of this 3 Michelin Star establishment and was slightly disappointed when I compared it to both The Kitchin (which has 1 star) and to Waterkloof where chef Gregory always has something new and exciting on his menu. The food is special but we can get as good or even better in South Africa. The meal was lacking that wow factor that I thought would be on the plate, with not one fresh ingredient to be seen anywhere. The pasta was freshly prepared and there was nothing wrong with the food but I do question how Michelin rating works. The service is what makes the difference here. There is nothing like it in South African restaurants. In Italy being a waiter is considered a profession and the Italians take pride in what ever job they do. The meal was an indulgence both gastronomically and price wise. Massimo came to greet each table but I am not sure that he actually remembered me from the Eat Out Conference where I spent some time talking to him. We were charged a cover of €10 a head which in my mind meant I did not have to add a tip to the bill. All in all this was something I am glad I have experienced and if you ever find yourself in Modena, it is worth a visit. After all of your talk about the quality of the service, I cannot believe that you left absolutely no service. These are professional servers who build experience from around the world, not local delicatessan servers. Also, coperto does not even go toe the servers. If you cannot afford to leave proper service, you cannot afford to dine there! Frank, thank you for your comment. After dining at numerous restaurants in Europe, we have been told that adding a tip is not necessary, nor the custom. Tipping is in fact not ordinarily expected in many countries where restaurant staff are paid a decent salary. This dining experience was one we could afford, even at the exchange rate of R14:€1. I will keep in mind that the coperto does not go to the servers when next we dine in a restaurant where that is charged. This sounds like a really special restaurant, Tandy. I do agree that South African fine dining is very hard to beat. Good service is really important though, and one can so often be disappointed in this regard. It is a she the meal was not greater than the 1 hat counterparts you have named. it certainly looks delicious, but you are right… there is not a single vegetable or fruit in sight 0! 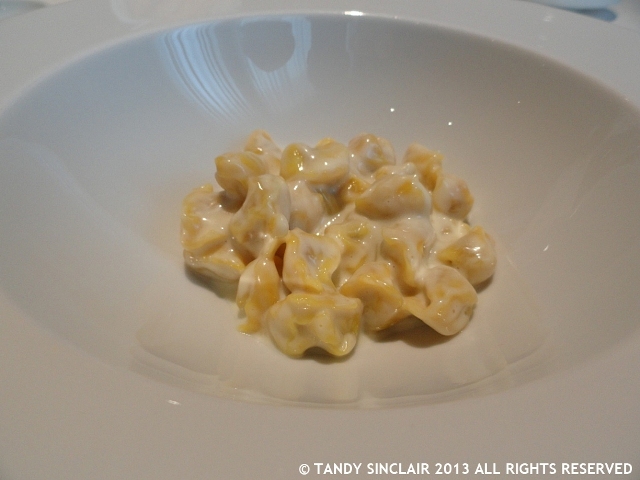 I do love the creamy look of the Modenese Tortellini in cream of Parmigiano Reggiono, but again… 3 stars?? The expectation is a little higher. I am sure it would be a lovely meal to share with a loved one. I quickly scrolled thru’ this last night with no time to comment. On a second scroll now, knowing how you had felt, I did it more slowly: I was of course not there to taste the food, but a few of the courses [ie the tortelini and the prosciutto] said vey little about any original thoughts emanating from the restaurant . . . perhaps menus vary due to quite a few circumstances . . . I like the memory of a mortadella sandwich – sounds very interesting. And a good wine, I could have a glass right now. Good wine makes all the difference! Note to self, don’t read food blogs on an empty stomach. I need, want, have to have it all! You’re living the life! What a pity it wasn’t the experience you were hoping for Tandy, especially at those prices and is so nice to hear we can offer better here at home, although I am sure we could get a few lessons in the service you enjoyed. It does look a very meat-centric meal, and I guess that is less surprising in the North… but no contorno or salad? I love Italian food, and the fact that often you can get really great food in a family restaurant with not a star in sight. It must be quite hard to present Italian tradition with a three star worthy twist. 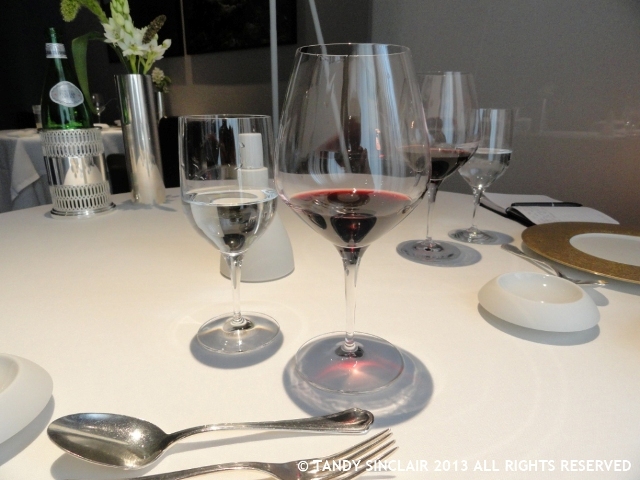 It is always an interesting experience to eat in a Michelin starred restaurant. Overall, I have had memorable experiences but occasionally there is one that I have said was good but not outstanding. It sounds like a wonderful experience but a shame that you were a little disappointed. I do understand – I have been to Rick Stein’s Seafood Restaurant twice and the first time he was there working and controlling things and it was wonderful, the second time he wasn’t and it was all just very..,uninspiring. Hi there Tandy! You look like you were having a great time in Italy. I would like to try the ribs with the glazed balsamic. You are certainly in the best spot to try that. I hope you bring home lots of great Vino, olive oil and balsamic from your trip. You are very lucky to visit and thank you for sharing with us all the gourmet eats! We were very lucky indeed! I’m sorry you were disappointed, but your photos are top class. Glad to know that we have equally/better offerings in South Africa.